Een gesprek met Eric Baudelaire en een screening van Letters to Max (2014). 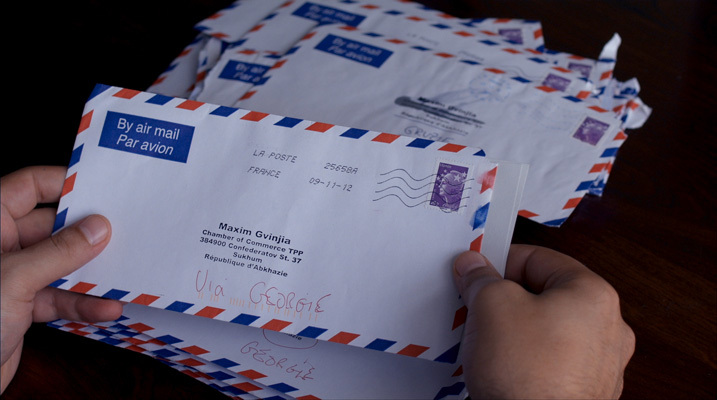 When Eric Baudelaire sent his first letter to Maxim Gvinjia, former Minister of Foreign Affairs of the Republic of Abkhazia, he was sure it would come straight back with a notice saying “destination unknown”. Because Abkhazia does not exist, at least not according to the United Nations and the majority of the world’s governments: it seceded from Georgia during a civil war in 1992-93, but its status remains in limbo, caught in a web of geopolitical interests, ethnic tensions and political unrest. However, the letter did actually arrive, marking the beginning of a long exchange which eventually shaped the fabric of Letters to Max: 74 letters sent over as many days, to which Max responded by recording his comments onto tape. The film became the chronicle of a close friendship, intertwined with the particular history of a stateless state, a place that is both real and imagined. Just like in his previous film works, notably The Anabasis… (2011) and The Ugly One (2013), both made in collaboration with Masao Adachi, filmmaker and former member of the Japanese Red Army movement, Baudelaire’s new film is grounded in a process of interchange and discovery, a process that ineluctably leads to unknown destinations, picking up traces of contested histories and unresolved questions on the way. But in any given space of contestation and invention there is no discovery without a sense of confusion and no interchange without a degree of disagreement. So what forms of cinematic perception and interpretation can be constructed as result of this uncertain hovering between different perspectives and sensibilities? How to find a position between refusal and fraternity? How to define the “point of view” of who or what is inbetween? And what does this enigmatic notion of “point of view” still mean after all, after having done its duty both in the service of Bazinian humanism and of Brechtian verfremdung, after having referred to both the gaze of the filmmaker and the blind spot of ideology, both to the position of the author and what it conceals; what can it possibly mean in today’s cinematic landscape, now that it finds itself permeated with a tendency to either hide behind an adherence to “facts… nothing but the facts” or dwell in a borderless sphere of indefinite ambiguity? Dear Max, Are you there?